“When you see so many people who look like you are dying of gun violence, it’s big. King’s legacy is huge. He died from gun violence." Emily Scott is a multimedia producer for WHYY News. A 2018 graduate of the journalism program at Temple University, Emily was formerly an intern in the WHYY newsroom. She was an editor for The Temple News, Temple University’s student-run weekly newspaper. Emily also is an alum of the Salt Institute for Documentary Studies radio program in Portland, Maine, and a 2017 winner of the Roy W. Howard National Collegiate Reporting Competition. (Philadelphia) — Murals of Martin Luther King, Jr. emblazoned with messages like “Conflict causes complications — brotherhood brings serenity” hang inside the gymnasium at Girard College in North Philadelphia. On Monday, they watched over 4 to 5,000 volunteers at the 24th annual MLK Day of Service. For more than two decades, volunteers have completed service projects like clothing donations, or voter registration in honor of MLK’s legacy at one of the city’s most renowned centers for civil rights history. In 1968, former city council member and lawyer Cecil B. Moore helped desegregate Girard College, which was once an orphanage only for white young men. This year’s theme was something that touched the heart of many Philadelphians: a world without gun violence. Sen. Bob Casey participated in the day’s signature service projects: the assembly of 100 portable booths decorated with messages about what a world without gun violence could look like, in line with the theme of this year’s service day. Many other Pa. politicians, like Gov. Tom Wolf, Lt. Gov. John Fetterman, State Rep. Malcolm Kenyatta, Attorney General Josh Shapiro and City Controller Rebecca Rynhart were among the many familiar faces volunteering on the signature project. The booths were assembled with synthetic plastic pipe and attached were panels of cloth with messages like “integrity,” “loyalty” and “honesty:” expressions of what a world without gun violence would be like. The completed booths will travel to different Philadelphia schools, community organizations and public spaces in the city, all with a lesson plan for reflection and discussion. Michael Cogbill, a former organizer with CeaseFirePA from Mt. Airy, helped with the planning of this year’s theme. The event kicked off with speeches from local politicians and community organizers, including Karen Asper-Jordan, the president of Cecil B. Moore Freedom Fighters, an educational activist group in Philly for more than 50 years. Jordan marched with Cecil B. Moore during the protests at Girard College to desegregate the school. Each year for the King Day of Service, the Freedom Fighters host a public workshop to teach the history of Cecil B. Moore and the Girard College desegregation movement. Asper-Jordan’s message was symbolically in line with this year’s theme for the day of service. Many of the service projects and workshops focused on young people, the impact of gun violence on communities, finding solutions and aspiring for peace. “No graduation. No proms. No birthdays. No holidays. No send off to college. … because of a gun,” read Yasmenn, 13, from Fitler Academics Plus School in Germantown. Many parents brought their children to Girard College to learn more about the city’s civil rights history and to learn about the values of empathy and equality remembered through MLK’s legacy. Danielle Garrett of Wynnefield, brought her daughter Janaah-Rae, a student at the Gesu School in North Philadelphia, to Monday’s service day. It was Garrett’s first time at the day of service, but her daughter has come in past years with her grandmother. 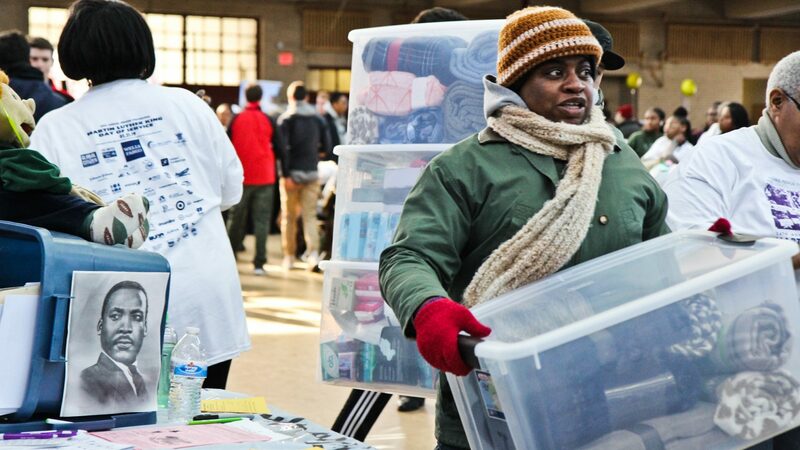 The MLK Day of Service at Girard College is historically the oldest and largest King Day of Service in the country. WHYY is the leading public media station serving the Philadelphia region, including Delaware, South Jersey and Pennsylvania. This story originally appeared on WHYY.org.